Spending hours on the beachfront is an exceptional use of your time during this North Myrtle Beach vacation. Comb the sand for beautiful seashells as they make the most memorable take-home souvenirs. Walk to the Cherry Grove Fishing Pier and watch fishermen of all experience levels reel in their own catch of the day. Go out to the beach early in the morning and marvel at the oceanfront sunrise, an East Coast specialty of which you might want to take advantage during your North Myrtle Beach vacation. These simple pleasures can make your North Myrtle Beach vacation that much more memorable. The North Myrtle Beach rentals at Beach N Fun have two bedrooms. There is a full kitchen in these condos in North Myrtle Beach, SC which makes your family beach vacation much more convenient. To have a sink, refrigerator and stove on hand makes all the difference in the world. And to have a dishwasher in your well equipped kitchen is the cherry on top of this vacation sundae. Make breakfast for the kids or fix some snacks that your whole family can enjoy on the balcony. 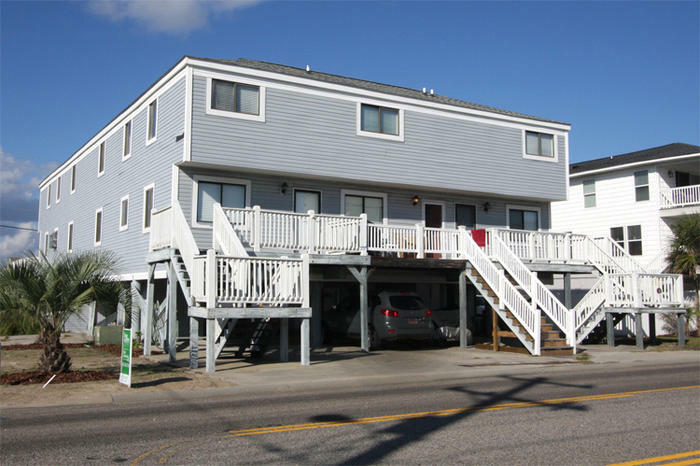 Conveniences in these North Myrtle Beach condo rentals include one full bath and one half bath. There is also a washer/dryer unit in these North Myrtle Beach rentals. These condos in North Myrtle Beach, SC are non-smoking units so inside and out you will enjoy fresh air. The list of North Myrtle Beach amusements and nearby Myrtle Beach attractions is quite extensive. Between Myrtle Beach golf courses, the beach, shopping and fabulous destinations designed just for kids, there is more than enough to fill every minute of every day of your North Myrtle Beach vacation. Water sports are quite popular in North Myrtle Beach, SC because this area of South Carolina is surrounded by water. From the Intracoastal Waterway and its creeks to the Atlantic Ocean and its inlets, there is water everywhere. Rent Sea Doos and jump the ocean waves or go on a dolphin watch cruise while you are in town. Parasailing behind a speed boat is a nice way to spend a few minutes of your afternoon. Get a bird’s eye view of the North Myrtle Beach landscape, sandy beaches and bright blue water. Your North Myrtle Beach vacation experience is immeasurable when you fill it with front row seats at a live entertainment theatre, such as The Carolina Opry or The Alabama Theatre after dining on succulent oysters and the fresh catch of the day plucked from the Atlantic Ocean just offshore. The family-friendly productions are filled with music, singing and dancing. There are generally shows nightly and these live entertainment theatres are quite easy to find. Have dinner at one of a myriad of restaurants in North Myrtle Beach, South Carolina. The beach has all kinds of food, from steak and burgers to sushi and tacos. There are more than 1,000 restaurants in the Myrtle Beach area so you can easily eat somewhere different for breakfast, lunch and dinner each day of your North Myrtle Beach vacation. Make life more adventurous during your North Myrtle Beach vacation by riding the thrilling amusement rides, horseback riding on the beach or fishing offshore in a large sport fish boat. A zip line ride leaves you exhilarated while the sling shot rides are simply scary. Soar to new heights with a whirl around the Myrtle Beach SkyWheel. Take surfing lessons and hit the waves during your North Myrtle Beach vacation or take shag dance lessons and hit the dance floor. For a quiet North Myrtle Beach vacation, make a tee time. There are more than 100 Myrtle Beach area golf courses and they are all beautiful. Spend a few hours a day on a gorgeous championship golf course in the North Myrtle Beach area. Let the sun follow you around 18 holes as you play past local wildlife, fragrant flora and natural hazards. For the ladies who love to shop, your North Myrtle Beach vacation can be filled with amazing days of shopping. The Myrtle Beach area boasts outlet malls where you can always find your favorite name brands at ridiculously low prices. Shopping complexes around town include Barefoot Landing, Broadway at the Beach and The Market Common. These shopping venues feature entertainment and dining sprinkled in among the stores. Barefoot Landing is just around the corner from Beach N Fun and is home to the Alabama Theatre, House of Blues and Greg Norman’s Australian Grille. When you choose Beach N Fun for your next family beach vacation in North Myrtle Beach, SC you will be centrally located to all the wild fun that North Myrtle Beach offers. Everything is right around the corner or just minutes away from this second-row North Myrtle Beach resort.